The Alpine Elf Hat with Feather is available in Blue, Green, or Red. Feather color will vary. One size, fits up to 7 1/8" head. 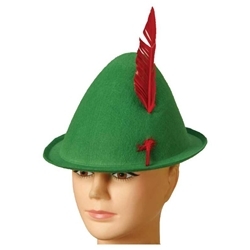 Perfect hat for Pinnochio, Peter Pan, holiday elves, gnomes, or for Octoberfest costumes.